I don’t think it’s just a coincidence that there is a rash of books about refugees suddenly available on the Australian book market. This month’s Australian Book Review includes a review by Peter Mares Confessions of a People-Smuggler by Dawood Amiri (Scribe) and of The Undesirables: Inside Nauru by Mark Isaacs (Hardie Grant). (Sorry, the ABR site is pay-walled.) Another title, Refugees: Why Seeking Asylum is Legal and Australia’s Policies are Not by Jane McAdam and Fiona Chong is reviewed at Readings, and no doubt there are others. I myself recently reviewed The People Smuggler by Robin de Crespigny. I think that there are a good many Australians who are appalled by Australia’s current policies and since the prospects of change look quite hopeless at the moment, it seems that about the only thing one can do is to try to counter the disinformation and hard-heartedness of the tabloid media through books. There seems to be two strands of reportage tackling this subject. There are the exposés about the current situation, aiming to penetrate the veil of government secrecy about what’s going on behind the shrieking headlines, and then there are books like the one I’ve just read, Surviving Year Zero, My Four years under the Khmer Rouge. Books like this aim to show the Australian public that they have nothing to fear from people who seek asylum here: people who flee their homes as refugees have escaped unimaginable horrors but have since proven themselves to be worthwhile Australian citizens. 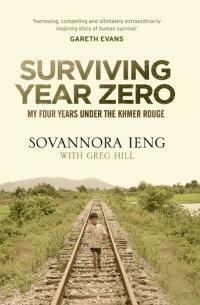 Sovannora Ieng’s story begins when he is just fourteen, as the Khmer Rouge arrive in the capital of Cambodia, Phnom Penh. His story traces the brutal four years during which his family were, like millions of others, uprooted from their homes, forced to work in the fields, beaten and starved, and spied upon by their friends and neighbours forced into it on pain of death. He himself was ‘lucky’ to escape execution. As we know, more than a million Cambodians didn’t (about 20% of the population died in the Killing Fields). It is an extraordinary story, told in simple prose that makes the horror painfully vivid. Then Thon came up to me. ‘You will come with us, ‘ he whispered. My stomach dropped. What did Thon want? He was just playing games again, I thought. That must be it. But there was last night. I had slept on guard duty, and he must have found out. Then I saw two Khmer Rouge soldiers. They were dressed in their black uniforms with their knives and guns holstered on their waists and AK-47s strapped across their shoulders. They nodded to Thon and he pointed. They walked straight up to me. Grabbing my arms, they twisted them behind my back, pushing me to the ground. They tied my hands and arms – my two elbows joined behind me – and covered my face with a cloth. Of course the fact that he can do this is because Australia gave him refuge when he needed it, patched up the education that he had missed out on, and supported him to grow into a confident and capable young man who could reach his potential despite his dreadful experiences under the Khmer Rouge. How many people of similar potential are languishing in our detention centres today, I wonder? You can listen to an interview with the author on Radio Australia here. I’ve read a few fictionalised accounts of this era (all from Canada, surprisingly), so would be intrigued to read a non-fiction one. The thing is the people who are so anti-refugee would never read it, so books like this tend to preach to the converted, don’t you think? Yes, that is what I think too, Kim. But when changing hearts and minds seems so hopeless, I think it matters to try and do whatever you can. I suppose that the first people who spoke out against the Vietnam War felt the same because for a long time they got nowhere. But it’s more than that, IMO, it’s a matter of personal integrity. Israel recognises this with its Righteous Among Nations honorific which describes people who risked their lives to save Jews during the Holocaust. What they actually achieved was a drop in the bucket, and I am quite sure that those people who tried felt that it was hopeless, but what they did – and their memory still does – is to show that trying is still worthwhile. (Hans Fallada’s novel, Alone in Berlin, is a classic example of a couple acting in what seems like a futile way against Hitler, but although they were taken away and exterminated, their story lived on, was novelised in Fallada’s book, and remains an inspiration to many). When I’m an old woman, and I look back over my life, I may not be able to say that I did enough, but I will be able to say that I did something. I couldn’t look my son in the eye if I did nothing about something I believe is wrong. I’ve written letters about prisoners of conscience for PEN and Amnesty, I’ve sent cross letters about foreign aid budget cuts to governments of all persuasions, and I’ve used this blog to try to raise awareness about books that present a different PoV. If it achieves nothing else, a book like Surviving Year Zero refuses to normalise the demonization of refugees. And when we read it, and blog it, no matter how hopeless it seems, it is a small act of defiance against something that is wrong. Totally agree… I guess one way of looking at it is that if someone like you and me (the “converted”) reads a book like this we can talk about it with people who may never read it or don’t understand the refugees’ point of view — and help enlighten people this way. I saw a wonderful news report on Channel 4 last week about the boatloads of refugees washing up on Italian shores all escaping wars in Syria, Iraq and Africa and remembered thinking Australia’s “problem” with boat people was miniscule by comparison. The beauty of the report is that it told the story from the refugees point of view; it put a human face to the issue — I wish everyone in Australia could see it. Oh, the attitude in Australia is ridiculous. I saw something last night about Turkey coping with the flood of refugees from Syria and the numbers were just breathtaking.